This post is part 8 in the series 20 Ways to Share Your Faith Online leading up to Internet Evangelism Day on April 25. We encourage you to tweet, share, blog & discuss these ideas in your church & circle of influence. Video. It is all over the internet. Did you miss a story on the news? Did you miss Steven Curtis Chapman’s performance on the Dove Awards? Did you miss your favorite TV show? That’s okay, because chances are you can find video of it somewhere on the internet. 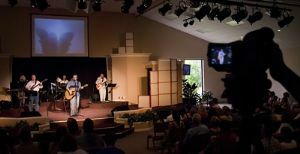 With the availability of inexpensive camcorders, YouTube, and website hosting providers like OurChurch.com, video is being posted like never before. I started using video on websites about a year ago. I had no idea what I was doing when I started. But I knew that using video and duplicating sermons on the internet was something I wanted to do. Even though we were pastoring a smaller church at the time, I felt that if we could get the message outside of the four walls of the church, that we could reach people. And we did. With adding blogs and video to our website and the use of social media, our page hits went up 500% in 2 months. The first response to our videos came from those helping in children’s church and the nursery. They were thrilled to have a way to access the sermon other than listening to a CD on the way to work. Many began watching the videos at work, which gained interest from co-workers. We have a following of members who are homebound by illness or disability, but our biggest response was from fellow pastors. They wanted to know how we were doing it and how we could afford it. They had a misconception that it was unattainable to them. Most churches already have the tools they need to put video on their site. Many churches already have a website and camcorders are now low-cost and affordable. If you don’t have a website that allows you to host video, make use of YouTube. If your church only has a Facebook page, upload video there. If you want better quality or a video longer than YouTube’s 10 minute maximum, invest in a website that hosts video, like OurChurch.com. Putting video on your site is simple to do and many website hosts including OurChurch.com has help pages and online tutorials to get you going in the right direction. I think that church and ministries who are not duplicating their message on their website are doing themselves a disservice. Adding video to an existing website is simple and will help your church or ministry reach people in a new way. Wendy Spoon is a mom, wife, and the web administrator for speakinggraceonline.com. I collect bicentennial quarters and enjoy reading. I am a licensed minister working on my ordination in 2010. Excellent post Wendy. I am enjoying this series. Good post, Wendy. I think video is right up there with social media and cell phones as having the greatest opportunity for evangelism. We live in just a media-centric culture that connecting with someone through video can be much more powerful than just text or text and images. Churches posting the pastor's messages or entire services are one good use of video. I love to see people tell the story of how God has changed their lives on video. And if you blog there are all kinds of opportunities to embed your own videos or YouTube connect with people and explore ideas. Good practical help Wendy. You hit many of the key benefits that can be derived from using video tech. I like that you mentioned the ROI of your blog, video and social media efforts. Using basic analytic tools doesn't have to be difficult either. "Reaching people in new ways" sums it up. There's really no reason not to experiment is there. One thing I like to emphasize with web video is that production quality is not as important as you might think. The content matters so much more. Just get your footage out there. You are right Paul. I like your idea. We blog 3 times a week and our midweek blog is always video. We use YouTube for the midweek blog, since it is short and meets YouTube requirements and so that we can place more video on our site. YouTube also allows us to reach people that we wouldn't reach otherwise. With the idea of using video for online outreach on my mind, it's amazing how many related posts I came across just in the last 24 hours. My church posts the audio of their sermons on their website, but does not post video (even though they have the capability to do so). I wish they would offer both.